Reed grew up in the Mississippi Delta and began her career at Newsweek magazine’s Washington Bureau. For 20 years she was a contributing editor at Vogue, where her profile subjects included everyone from Oscar de la Renta, Robert Deniro, and Sister Helen Prejean to George and Laura Bush and Bill and Hillary Clinton. She is the author of multiple bestselling books, including: But Mama Always Put Vodka in her Sangria: Adventures in Eating, Drinking and Making Merry; One Man’s Folly: The Exceptional Houses of Furlow Gatewood; The House on First Street: My New Orleans Story; Ham Biscuits, Hostess Gowns, and Other Southern Specialties; Queen of the Turtle Derby and Other Southern Phenomena; and Julia Reed’s South: Spirited Entertaining and High Style Fun All Year Long. 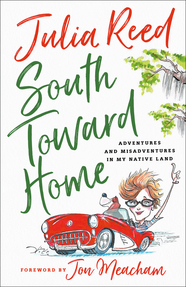 Her latest book, South Toward Home: Adventures and Misadventures in My Native Land, was released July 2018. She lives in New Orleans, where she served as board chair of the Ogden Museum of Southern Art for seven years. Currently, she is a member of the National Advisory Board of the Eudora Welty Foundation. Follow Julia on Facebook. Julia Reed, a master of the art of eating, drinking, and making merry, takes the reader on culinary adventures in places as far flung as Kabul, Afghanistan and as close to home as her native Mississippi Delta and Florida's Gulf Coast. Along the way, Reed discovers the perfect Pimm's Royale at the Paris Ritz, devours delicious chuletons in Madrid, and picks up tips from accomplished hostesses ranging from Pat Buckley to Pearl Bailey and, of course, her own mother. Reed writes about the bounty—and the burden—of a Southern garden in high summer, tosses salads in the English countryside, and shares C.Z. Guest's recipe for an especially zingy bullshot. In essays on everything from pork chops to the perfect picnic Julia Reed revels in the simple good qualities that make the Southern table the best possible place to pull up a chair. She collects her thoughts on good cooking and the lessons of gracious entertaining that pass from one woman to another, and takes the reader on a lively and very personal tour of the culinary -- and social -- South. An Evening with Julia Reed Writer Julia Reed discusses the inspiration of much of her writing—the comforts of Southern life. Using her recipes and her essays as examples, she shows us the influence that the Mississippi Delta and New Orleans has on her identity and her work. 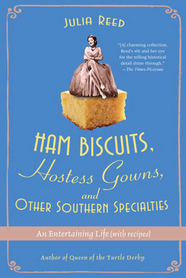 Ham Biscuits, Hostess Gowns, and Other Southern Specialties Julia Reed gives a presentation based on the contents of her hit book, Ham Biscuits, Hostess Gowns and Other Southern Specialties: An Entertaining Life (with Recipes). She provides tips and personal insight into gracious hosting, successful dinner menus, and charming conversation—all with an ease and simplicity that are distinctly present in her depictions of the South. Read Julia’s latest Garden & Gun piece on Southern gentlemen. Read Julia’s TIME magazine column on local eatery Doe’s Eat Place. Julia talks about living and writing in the American South on WBUR. The New York Times picks South Toward Home as New & Noteworthy for the week of 7/22. Deep South magazine listed South Toward Home in its 2018 Summer Reading Roundup. Read the Kirkus review of South Toward Home. South Toward Home helps cure Southern homesickness for a BookRiot contributor. Check out Julia Reed’s work on Garden & Gun. Take a look inside Julia Reed’s Garden District apartment. Learn how to make Julia Reed’s famous Chess Pie Squares. Read all about Julia Reed and southern hospitality. "Loved Julia. What a hoot! She is a great storyteller, plus she layered in quite a bit from her substantial journalistic career. The audience had a blast." "Julia was very entertaining; a great storyteller whose wit comes through continuously throughout her remarks. She was great to work with and left us all exhausted from laughing so much!" "We had about 45 people attend her event that morning and everyone at her session really enjoyed meeting her. Thank you so much for all your help in bringing Julia Reed to Memphis for our first annual book festival." "Julia was a big hit at our show! Her lecture was sold out and we heard nothing but praise for her lecture. The way Julia shares her experiences to the audience is entertaining and hilarious. She was wonderful to have as our guest and keynote speaker." 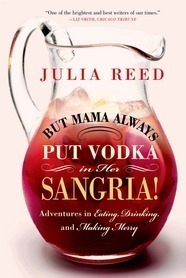 "Julia Reed is another Southern writer with a fine hand for storytelling and cooking. Though you'll want to cook from her book, first you'll want to take it to the porch hammock to read. Each tasty tale - from her collard green chronicle to her Frozen Assets anecdote on ice cream - will whet your appetite for more." "No matter what your tastes, Ham Biscuits has something to tempt your taste buds."